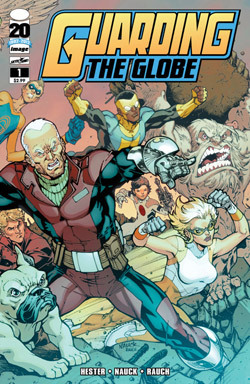 Guarding the Globe #1 is the debut of the on-going adventures of the government super-team Guardians of the Globe that was created by Robert Kirkman and company in the pages of Invincible. The Guardians have had their own successful mini-series and now it seems they are ready to tackle their own missions and personal problems. From the first page we jump into the action as we see the team ending their battle with a couple of creatures called Magnamites. They are quickly taken down by members Kid Thor and Japandroid. As soon as the battle is over team leader Brit takes off as he is late for a doctor’s meeting with his wife concerning their son. Other team members Best Tiger and Kaboomerang are in Hong Kong to stop some baddies from doing bad things, those bad things being the selling of black tar heroin, which we later find out from a briefing at the Pentagon lead by Robot. In that same briefing we learn more about what the rest of the team is doing to prevent another attack from the Magnamites. We also learn that the Chupacabra is back in action taking down biker gangs in Mexico, to the displeasure of Brit. The issue ends with a glimpse of the man behind the heroin selling and the return of a familiar villain from the Guardian’s past. This issue is a great jumping on point for anyone who is unfamiliar with these characters or wants an expanded feel to the Invincible universe. Phil Hester does a great job introducing the entire team, which is rather large, but mainly focusing on Brit. We get a feel for the type of man who Brit is, a hero, a father, and a friend. An argument Brit has with Cecil, who is the man in charge of the government team, lends to issues Cecil has had with Invincible in his book. Where people who where disgraced or not heroes get another chance to try to redeem themselves. Phil Hester seems to be taking points from Kirkman’s style by setting up a bunch of storylines that could start paying off in the next issue or somewhere down the line in issue 20. Though the book is heavy on Brit, the highlight of the book will be seeing all these different characters interact and the reader getting to know them as a team. I know I am looking forward to knowing more about the French smoking pug. Todd Nauck’s art is energetic in the action scenes and touching and detailed in the quiet moments, like when Donald and Brit are throwing a baseball around talking about their problems. I am looking forward at what’s to come, as fan of Invincible I hope that at some point the two books line up to tell stories that Kirkman won’t get to tell in Invincible with these characters. I don’t want the book to be relying on Invincible because the book is very much able to stand on its own, but further down the line, if and when a story comes along where Hester and Nauck could add to the story or just take ideas and make up their own, I think it could be a fun thing. But for now I’m just looking forward to getting to know these characters and what insanity will come their way in this universe.